1. Preheat the oven to 200°C, gas mark 6. 2. Place the figs, cut side up in a small roasting tin and drizzle with honey. Bake for 10 minutes until softened. Mix into the tin 1 tbsp oil and 1 tbsp vinegar to make a dressing and reserve. 3. Toss the watermelon and melon cubes, and salad onions with the remaining vinegar. 4. Mix together the flour and paprika, and season. Add the halloumi and toss until evenly coated. Heat the remaining oil and fry the halloumi for 3-4 minutes until crispy and golden all over. 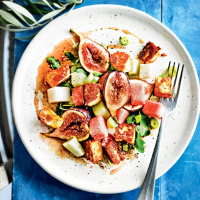 Arrange the rocket on a platter, top with the melon mixture, halloumi and figs. Drizzle over the fig dressing and serve warm.